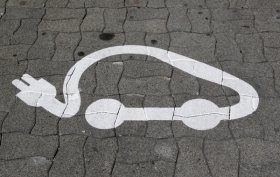 Combined deliveries of hybrids and EVs may reach 5.2 million by 2020, J.D. Power & Associates says. That would be about 7.3 percent of the projected global vehicle market. LONDON (Bloomberg) -- General Electric Co. may jump-start the electric-vehicle industry with an order that CEO Jeffrey Immelt said will be the largest in history. GE, whose power-generation equipment provides a third of the world's electricity, will order “tens of thousands” of the vehicles in about a week, Immelt said Thursday in a speech in London, without giving a total or identifying a manufacturer. Automakers preparing to sell vehicles powered solely by batteries over the next 18 months include Nissan Motor Co., which begins delivering Leaf hatchbacks late this year in the United States and early next year in Europe; Mitsubishi Motors Corp., which starts delivering i-MiEV minicars in Europe late this year; Ford Motor Co., readying electric versions of its Transit Connect delivery van and Focus compact car; and Toyota Motor Corp., which will sell a rechargeable RAV4 SUV. General Motors Co. begins delivering plug-in Volt hybrids this year, and Honda Motor Co., Chrysler LLC, BMW AG and other large brands are preparing battery vehicles due later this decades. Expanding the world's fleet of electric vehicles would bolster GE as it expands so-called clean-energy technology such as car chargers, solar panels and wind turbines. For every dollar of EV sales, GE estimates it may get 10 cents in revenue, said Gary Sheffer, a spokesman. Immelt said half of GE's sales force of about 45,000 will drive EVs. The Fairfield, Connecticut,-based company also has a vehicle-leasing division through its GE Capital finance unit. Financial terms and other details about the order aren't yet being disclosed, GE said. GE is investing $10 billion over the next five years in clean energy across its business lines, including power-transmission software and so-called smart-grid technologies. Its products include lithium-ion batteries for cars and trucks via a venture with A123 Systems Inc. and sodium-based batteries for use in large vehicles such as locomotives. That spending creates jobs, Immelt told executives at an event sponsored by the University of Cambridge's Programme for Sustainability Leadership. Combined deliveries of hybrids, such as Toyota's Prius, and battery-powered cars may reach 5.2 million by 2020, according to an Oct. 27 forecast by J.D. Power & Associates. That would be about 7.3 percent of the projected global vehicle market. Immelt used his remarks in London to renew his call for increased private spending on renewable-energy investments. GE Energy Infrastructure is the company's biggest industrial unit, accounting for $37 billion of the parent company's $157 billion in revenue last year. GE is the largest shareholder for Watertown, Massachusetts- based A123, which has signed agreements with Navistar International Corp. and Fisker Automotive Inc. to supply advanced batteries for their vehicles.